For a while there, it seemed like WizKids had a new game announcement every day. Well, now we're getting the other half of that, as they've got them hitting store shelves. This time around it's Dungeon Hustle. In the game, players will take on iconic dungeon-delving characters such as fighters, rogues, clerics, or mages and head into the dark and nasty tunnels in order to get treasure. But the monsters there, obviously, don't want you to take their loot, so they're ready to fight for it. Also, they've realized the dungeon's not the nicest place, either, and are looking to escape. Players will have to make sure that doesn't happen. Get ready for a new experience in dungeon crawling adventure! 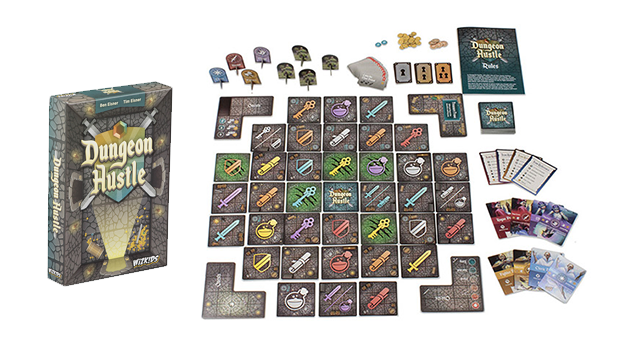 WizKids proudly presents Dungeon Hustle, designed by Ben Eisner and Tim Eisner, available now in North American game stores. In Dungeon Hustle, 2-4 players explore an ever-changing dungeon that holds valuable treasure and work to keep monsters from escaping into the outside world! Become the role of a Fighter, Rogue, Cleric, or Mage and equip yourself with Potions, Scrolls, Shields, Swords, and Keys. Each item comes in a different color, and you must HUSTLE through a path of that matching color to pick up the cards. You must then rebuild the path you’ve explored, hoping that a wandering monster hasn’t followed you! Defend against monster attacks and open up rare chests for epic rewards!